A Medtronic 523, 554, 530G (551/751), 723, or 754 Insulin Pump. Click here to learn more about our Medtronic compatibility. A Contour Next LINK Meter. Please confirm the back of your meter reads "Contour Next Link". It's easy to get this meter confused with the Contour Next Link 2.4 meter, which will only work with newer Medtronic 6xx pumps. Select “Medtronic 523, 723, Veo or 530G (using Contour Next Link)” as your device. Enter your insulin pump’s serial number. 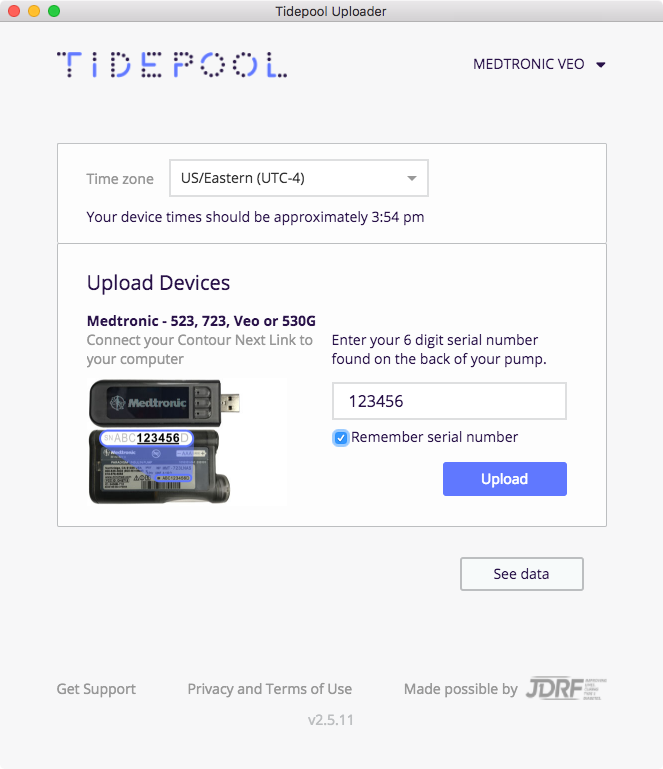 If you are uploading from your personal computer, you can check “Remember serial number” to have the Tidepool Uploader remember your serial number. Connect your Contour Next Link meter to one of your computer’s USB ports. After your upload is complete, you can upload additional devices, or click “See data” to view your diabetes data. If you encounter any errors uploading your Medtronic 523, 554, 530G, 723, or 754 insulin pump you will see an Upload Failed screen. For example, the message below indicates that some other software like CareLink, OpenAPS, or Loop is attempting to communicate with your insulin pump. You will need to disable that software for the duration of the upload. 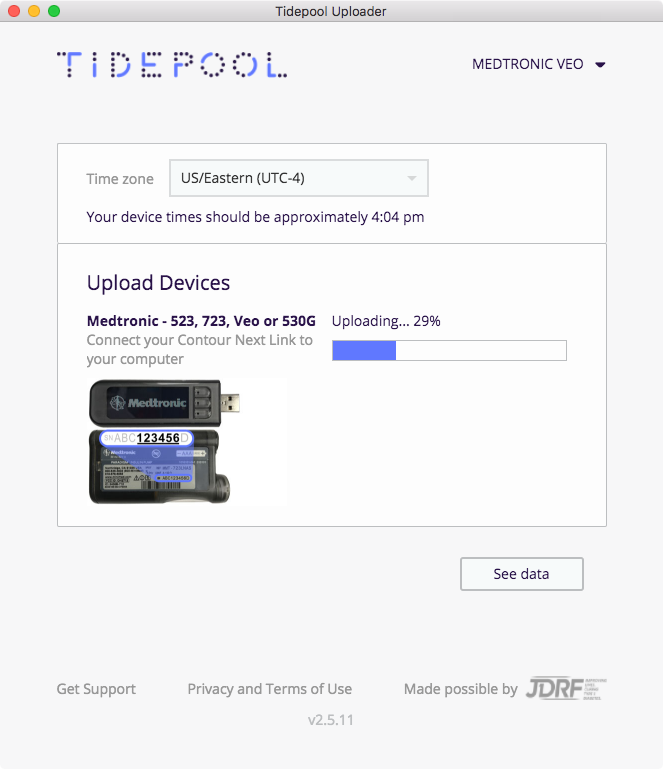 Confirm you have downloaded the latest version of the Tidepool Uploader (Version 2.x). The version of the Uploader can be found in the footer of the Uploader window. You can download the latest version at https://tidepool.org/uploader. Confirm the serial number you entered in the Uploader matches your Medtronic 523, 554, 530G, 723, or 754 insulin pump. Shut down and restart the Tidepool Uploader if it has been left open for an extended period of time. Disconnect/reconnect your Contour Next Link meter if it has been connected to your computer for an extended period of time. 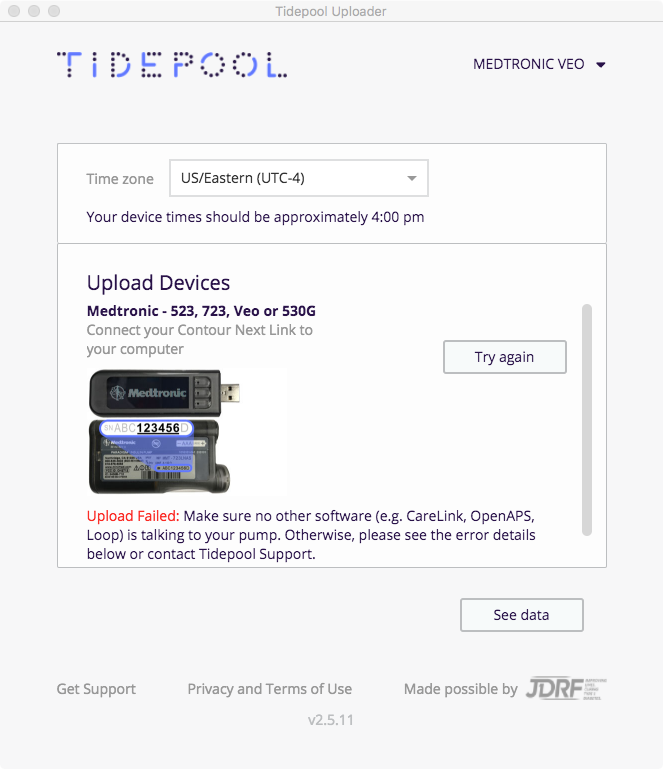 If you are seeing an error repeatedly after trying to upload your Medtronic 523, 554, 530G, 723, or 754 insulin pump, please copy the error message text or capture a screenshot of the error message and contact us at support@tidepool.org so we can diagnose the problem. 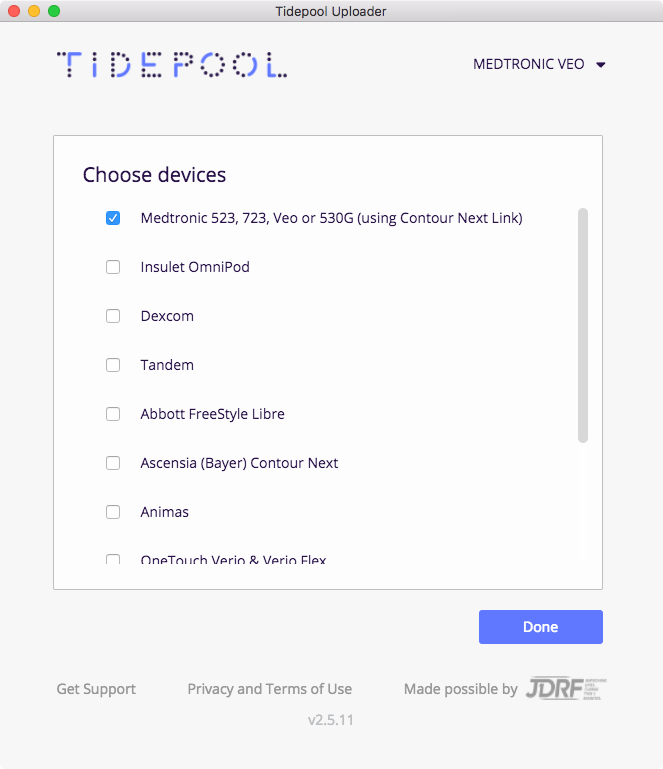 Tidepool is currently compatible with Medtronic 523, 554, 530G, 630G, 640G, 670G, 723, and 754 insulin pumps. Click here to view our guide for uploading 630G, 640G, and 670G insulin pumps. 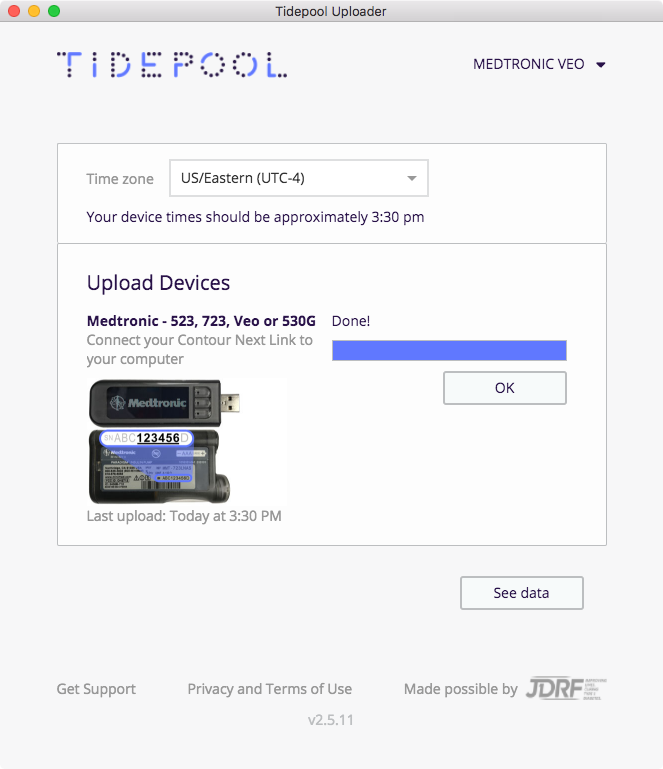 Why doesn't Tidepool work with Medtronic 522 or 722 insulin pumps? As far as Medtronic 522 and 722 insulin pumps are concerned, the main issue for us relies in extracting reliable scheduled basal rate start times. While we can extract all of the settings from Medtronic 522 and 722 insulin pumps, including scheduled basal schedules, the problem is that the these pumps do not store when the scheduled basal actually starts. Because the programmed start time and the actual start time can be affected by various factors, they are not always the same. Trying to infer when the scheduled basal rates actually start and stop, when we only have temp basal start events, suspend/resume times, and basal schedule settings is not worth the risk of presenting possibly inaccurate information.